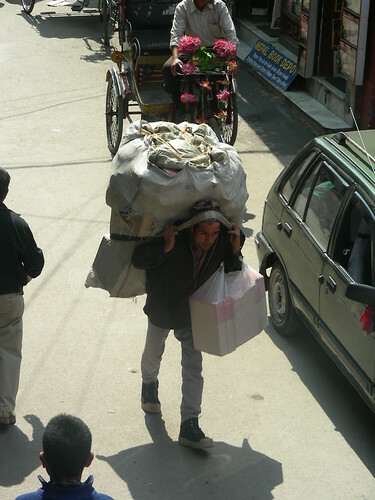 In many rural and urban areas in countries in Africa, the Indian subcontinent, Latin America and elsewhere, loads are routinely carried on the head. If a young person has learned the technique well from their elders and is well-practiced, head porterage is a very efficient method of transportation. Research carried out over a quarter of a century ago at the Catholic University of Louvain found that Luo and Kikuyu women of East Africa were able to carry loads of 20 per cent of their body weight without increasing their energy consumption. For heavier loads, there was an increase in the amount of energy used: a 30 per cent load increased energy consumption by 10 per cent, while a 40 per cent load caused an increase in energy consumption of 20 per cent. Additionally, they were far more efficient than army recruits carrying equivalent loads in backpacks. More recent research published in 2005 by the same team, investigating the Sherpas of Nepal, found that men typically carry 50 kg loads and women 40 kg loads. In an emergency, they carry 80 kg and 60 kg respectively over relatively short distances, which is more than their own body weight. Female Sherpa porters were more efficient by a metabolic cost of around 25 per cent at carrying loads than the sample of East African women studied a quarter of a century earlier. Nevertheless, not all of those accustomed to head-load carrying can perform it efficiently. Research in Ghana in the early 1990s found that among some 305 head porters (164 males and 141 females) cervical spondylosis was not exclusively a function of age, but a consequence of heavy load carrying on the head. More recent research carried out on 24 Xhosa women, in South Africa, by researchers from the University of Abertay Dundee called into question whether head porterage is more efficient than carrying loads in a backpack. Using the latest laboratory technology, the researchers found that the women, 13 experienced head-loaders and 11 with no experience of head porterage, used as much oxygen when carrying loads on their heads as they did when the loads were placed in backpacks. 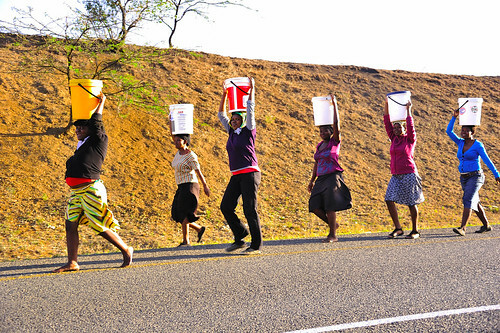 In other words, the Xhosa women were using the same amount of effort whichever way the load was carried. Interviews with the women also revealed that many suffered from neck pain, and that they routinely received massage from family members to alleviate it. The lesson seems to be that not all individuals or social groups get the most out of the potential mechanical advantage bestowed by heavy porterage. Overall, though, the evidence seems to be strongly in its favor in terms of efficiency. My view is that discrepancies in metabolic and other markers of efficiency between different groups carrying loads on their head might well be accounted for by better or worse general coordination – efficiency in allowing the body weight to transmit into the ground in everyday standing and walking, for example – among those who are studied. That dimension does not seem to have been fully appreciated or taken into account by different groups of researchers. Nevertheless, although head-carrying is efficient for some highly-skilled individuals, I have yet to see anyone in London, New York, Dublin or Paris walking around carrying a shopping bag, suitcase or laptop on the head. In Western-influenced societies, this type of behaviour does not conform to our norms and customs — “People would look at me if I did that!” a friend of mine told me when the subject came up recently. Perhaps the conceptual frameworks in the open multicultural society of London in which she resides need to expand or stretch a little to encourage people to experiment with carrying loads in this way rather than in bags on the end of the arms.